Posted by Ronald Cifuentes on August 2, 2016 at 4:50 PM. Filed under LED Lighting, How To, Around the Home, News . Are you on the search for fun and unique ways to use string lights around your home? We recently partnered with some incredibly talented bloggers to help inspire you with unique ideas and clever ways to hang Enbrighten Cafe String Lights — from enchanting patios and backyard upgrades to creative indoor decor ideas, to outdoor entertaining tips and more! Get inspired with these DIY projects and be sure to share your own cafe lights inspiration with us too on Facebook, Twitter and Instagram! When it comes to commercial-grade LED cafe string lights, most people naturally think of using them outdoors. While café lights are a great way to improve outdoor areas like your porch, patio or backyard, you can add just as much charm and ambiance to create an inviting space inside your home. Here are some creative ideas for using cafe lights indoors. If you're feeling extra creative, this great project combines Enbrighten Café Lights with something in your home that you no longer need, like bed springs from an old crib to create a DIY chandelier. To accomplish this you just need a bit of creativity (and maybe a ladder) to transform any ordinary area into a fun and unique space. A helpful tip before taking on this project is to keep in mind cord length and where the nearest outlet is located. 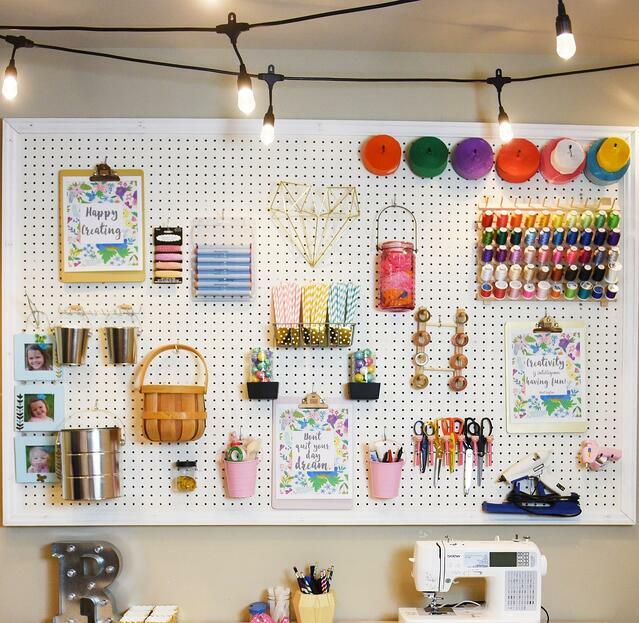 Create a work space that inspires you! Cafe lights are a fun alternative to overhead lighting and provide a warm even glow throughout the room. Whether you choose to drape along a wall, create a pattern above a workspace, or hang them around the room's perimeter, you can add your unique touch to any space and switch up the look for different rooms by moving just a strand or two. 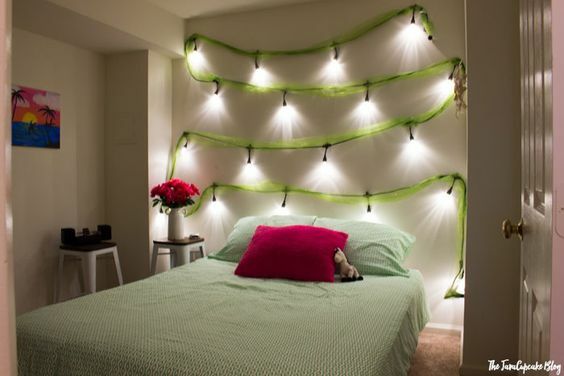 With the ability to link multiple sizes and strands together, it’s easy to add string lights to fit any size room. 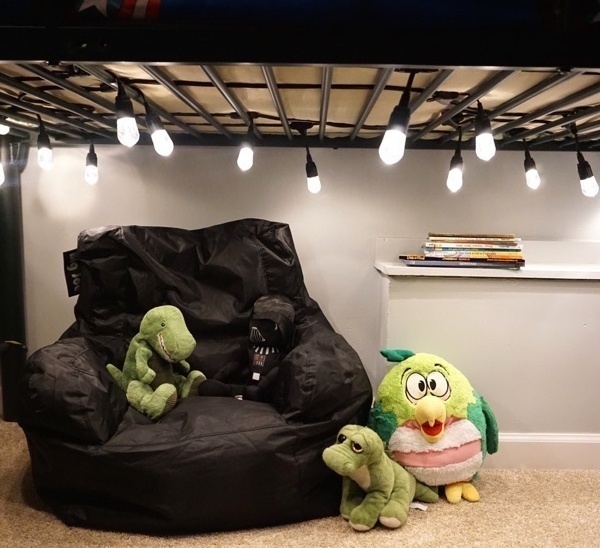 Creating a DIY reading nook is a great idea for the little “book worms” in your family or if you have grown-up “book worms” heading to college this fall. Take advantage of the lofted bed setup by stringing cool-to-the-touch energy-efficient LED cafe lights around a bed frame to add ambient light that is great for getting lost in a story or lighting up a study space in a dorm room. 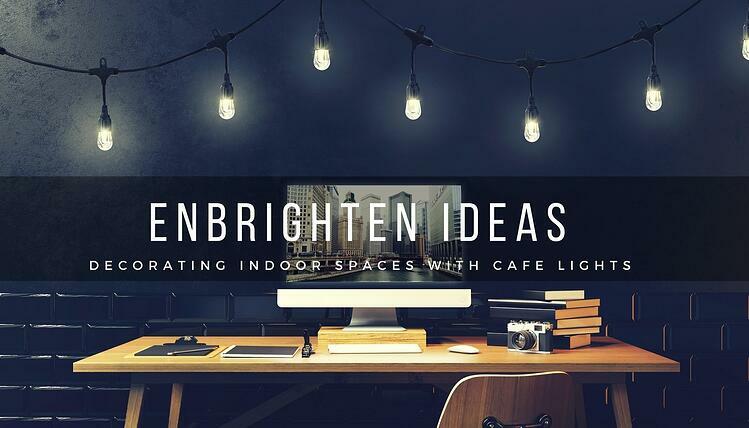 Enbrighten Cafe Lights are a great way to bring focus to a specific wall or area of a room, like a family photo wall or the main wall of a bedroom. 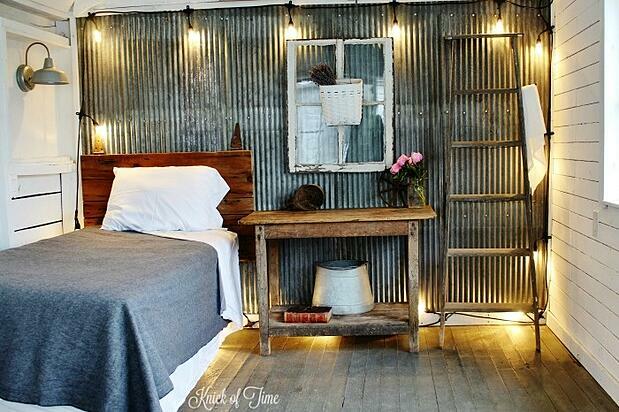 Angie used the lights to help complete the rustic farmhouse look in her guest room. Not only do they help illuminate anything on the wall but they can also offer a different mood to the room once they become the only lights on. A twinkling headboard is simple to make and creates instant mood lighting. A lighted DIY headboard not only makes a big statement in a fun way but also creates a soothing atmosphere with soft ambient lighting. You can even use a sheer fabric to help disguise the cord and blend it into the color scheme and décor of your room as well. 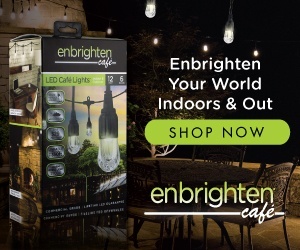 With Enbrighten LED Cafe String Lights, you never have to worry about the bulbs burning out or breaking from being dropped and unlike other string lights, they are much safer to use indoors with LED bulbs that are rated for year-round use and never get hot to the touch. Ceiling/overhead lighting in craft rooms, offices, and living rooms. 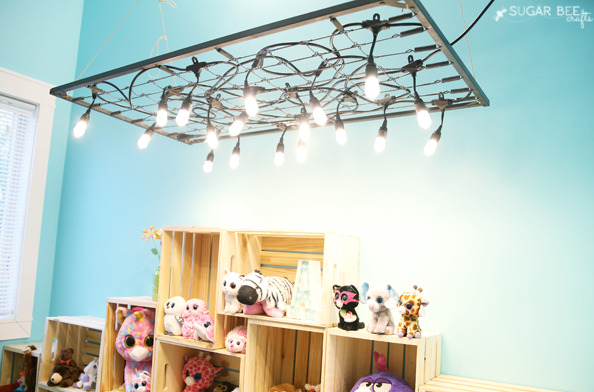 DIY cafe light chandelier in a play room or over a dining area. A cozy reading nook or stylish study space under a lofted bed in a bedroom or college dorm room. Charming accent wall to create a fun and inviting atmosphere for any room. Illuminated headboard to add a magical touch for kids, teens, and anyone who loves a little sparkle. Stay tuned for more cafe lights inspiring ideas for backyard upgrades, outdoor entertaining, enchanting patios and more all to come!